Sally's Window of Scraps . : Fresh Brewed Designs welcomes New DT!! Today is an exciting day over at Fresh Brewed Designs!! Today Heather is introducing some new members to her Design Team and I am excited to say that I am one of them =) I love Heather's sweet spirit and I love her images!! Yesterday morning before work I broke out this sweet rubber stamp I purchased some time ago of a Coffee Truck - how cool would that be to have a coffee truck drive up to your house just like the ice cream trucks =) It would certainly put a smile on my face!! Thanks Heather - I look forward to creating with you and all the other Design Team Members!! Thanks so much for stopping by - be sure to stop over at Fresh Brewed Designs and check out all that is going on - Fun Times ahead for sure!! Hi there new teamie!!! I'm looking forward to scrolling through your wonderful creations!! I mean Grandma! :) I am so excited for you .... I know this is to be about welcoming you to the team, and it is ... but I am just beaming over here thinking about you and all of the wonderful things you are experiencing right now with your new grandson. I am so happy and honored to have you on the team. I feel like we have known each other forever... and now we get to share this together too! I am thrilled! Your card today is so fun and trendy! I love the colors and the way you cut the image. I think that should be my goal .. to start a coffee truck company :) lol!!! For now I will stick with stamps. Sending you big, warm hugs! Fantastic card! Love that stamp :) Congrats on the new DT!!! Welcome to the team Sally. Such a fabulous card too. Looks like lots of things to congratulate you on. I love your layout on your card. I am sure you will have a fab time on this team! 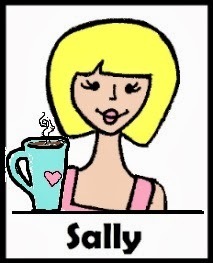 Welcome Sally. Congrats on being chosen as part of our team. Your first card is adorable and I look forward to seeing many more! ps congrats also on becoming a grandma. You must be thrilled! Hi Sally! CONGRATULATIONS ON BECOMING A NEW GRANDMA!! How very exciting! There is nothing like it! (Speaking from experience!) What a wonderful blessing! He is so beautiful! Then of course, WELCOME to the FBD team! Your card is BEAUTIFUL! I love the papers, colors, layout and buttoned bow embellishment you used! I have always loved this coffee truck too! Heather is so creative!! I'm always eagerly waiting to see what she draws up next!! I'm looking forward to getting to know you more! I'm so very happy to have you on our team! Congrats, Sally, on your DT position at Fresh Brewed Designs! Such a nice place to create! I know you will love working with Heather! We loved having her as a DT member at SSW! Ok Judi, now I am emotional in the mornings.. don't make me cry! You are too sweet. I am so happy that my DT start was with SSW! Love all of you ladies! Welcome!! your card is gorgeous Sally!! So glad to have you part of the Fresh Brewed Designs DT!! What a fun image...I agree there should be more coffee trucks in the world! Congrats on your new DT position.